We were only there for a few days and I quite loved it. It is such a graceful and liveable city, at least in the centre. Everyone walks so much slower there. You spend time in the sidewalk cafes, in the restaurants, in the bars. No one is in a hurry. The food is good, and so is the wine. Flowers line the wrought-iron balconies. Bookshops are everywhere. Style abounds. My god, the cheese alone is a wonder. You look at some of those everyday apartment buildings, and in comparison to the new insanely expensive glass-and-steel development mushrooming along the Thames, you think to yourself that those are really what is meant by luxury flats. None of the new abominations that hurt my soul are to be found here in the centre. None at all. And yet. In the words of Ivan Chtcheglov, ‘We are bored in the city’. I think it is because they (in particular Haussman) have bulldozed the mystery. The poor were moved out to the banlieues, places that seem designed to contain and suppress their energies. We didn’t make it out to them, it felt too voyeuristic somehow. Yet I confess in most cities I have lived in, our neighbourhoods are best for a little crazy colour, street vendors, rich smells of food, music, people chilling outside, general chaos. And the built environment? Of course, I say to myself, of course it produced the Situationists. The yearning for alleys and corners and contrasts and wonder. Because most of that is gone. I am not a fan of slums, no, but this is built for cars and the control of people. Stories of romance and adventure are impossible here. 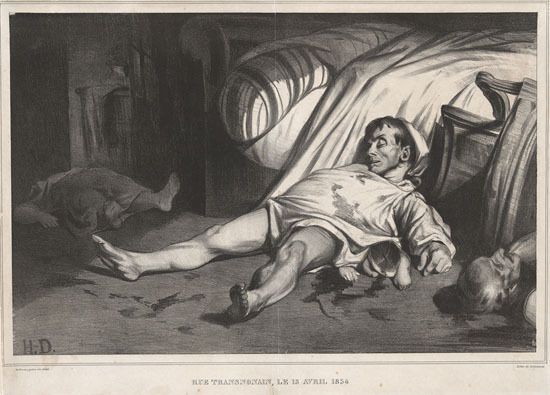 Daumier himself, one of my favourite artists who ruthlessly chronicled abuse of power and privilege, is rarely mentioned, has no museum or home or collection to remember him by that I could find. There can be no doubt of the politics of value here. But it is the tomb of a Scot, well, someone descended from a Scot at least, name of Robertson. My sister in law’s family probably. All cities are geological and three steps cannot be taken without encountering ghosts, bearing all the prestige of their legends. Paris has done its best to erase the ghosts. You have to know your history to feel their absence. It should not be forgotten that modern Urbanism has not yet been an art–and even less a setting for life–it has on the other hand always been inspired by Police directives; and after all Haussman only gave us these boulevards to more conveniently bring in the cannon (Lettrist International, Potlatch no. 5). We found a few remnants of the arcades so loved by Aragon and Benjamin, vilified slightly by Zola, all of them feeling like well-preserved leftovers and decidedly private — thus very closed on a Sunday. Shut when I dragged Mark to see them despite all misgivings. Sadness. Almost all surprise, strangeness, wonder is brought to Parisian streets by lively art, détournements everywhere both playful and clever. There is Paris under the sea, and more to come. There is much to love, especially the way that people live and play in public space, and I’ll explore that too. While there are still some narrow winding streets to lose yourself in, always you find yourself back in broad boulevards of a sameness and the mystery is mostly gone. They couldn’t kill it entirely, it is too strong for that, but they have tried.